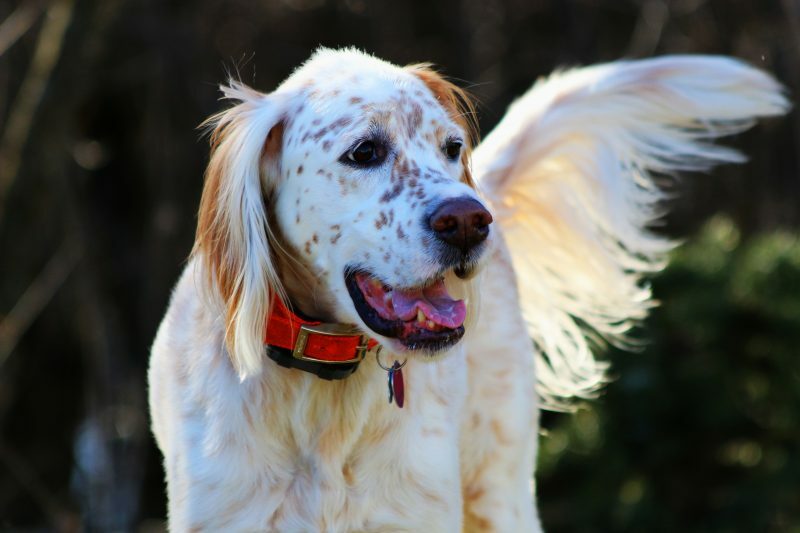 While certain segments of the population consider them show dogs, the English Setter will forever be known to me as one of the best bird dogs around. With an incredible nose & an even better temperament around the house, they make a great companion both in the field & at home. Our last 3 family dogs have all been English Setters, and we couldn’t have been happier with them. My current dog, Trigger, is a 6 year old Ryman Hemlock English Setter that is one of the best dogs I could ask for. Sure, he’s got some quirks (he’s really good at grabbing food off the counter) but I attribute that more to a simple lack of emphasizing those areas in training early on than anything else. Every dog we’ve ever owned has always been a family dog first, bird dog second. While it’s certainly important to me to have a dog that is great in the field, the reality is that they’re going to be spending more time with our family at home than they are hunting. I can honestly say that the English Setter checks every box I look for when it comes to a family dog. They’re great with kids and have enough energy to be entertaining but not so much that it’s overwhelming. At the time I’m writing this I have a 2-month old son (Elliott), and Trigger couldn’t be better with him. Trigger acknowledges that Elliott is there & even lays there and watches him, but never gets too close to him where we would be concerned about Elliott accidentally getting stepped on. We’ve also had toddlers come up to Trigger & play around with him – everything from petting him to tugging at his fur & face – and he just sits there and lets it happen. If anyone is going to stop the kids from doing what they’re doing it is going to be me, not Trigger. In my book, that is definitely a sign of a great family dog. I’ll start this off by saying I’m definitely biased, but I’m going to do my best to stay as neutral as possible here. 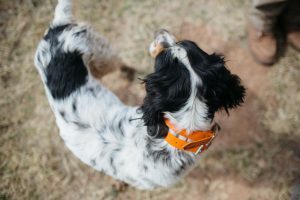 English Setters have some of the best upland bird hunting abilities I’ve ever seen. Depending on what line of English Setter you have, they can be close-working or range quite a bit. I’ll dive into that in a different article, but suffice to say that English Setters come in a wide range of sizes, & energy bundles. Trigger is from the Ryman Hemlock line, and he works nice and close – perfect for the grouse woods. He checks back without me needing to do anything. Since he works so close it makes locating him when he goes on point in the grouse woods significantly easier. It also means that if the grouse are a little spooky that day and flush before he gets a chance to point, it still provides a great opportunity for a shot. Obviously you need to do your homework on breeders & lineage, but english setters have some of the best natural hunting ability I’ve seen. I brought Trigger home at 6 and a half weeks old & he didn’t hesitate at all when I put a frozen grouse wing out for him. He locked up on point (puppy gut and all), and I knew right then that I had a hell of a bird dog on my hands. All it took to get him fine-tuned was simply getting him on as many birds as possible in that first year. He’s been a rockstar in the grouse woods ever since.